Archery Terminolgy or the words used in modern day archery are very unique and different. A feather on a bow is no longer a feather it is a fletch. The tip of the arrow is no longer just a tip it is called a broadhead. When I first started shooting I had to keep going back to the glossary terms in order to understand what to buy and what to call what I suppose to ask for. I remember the first time I went to Cabela's I had no idea what to ask for. I just wanted a target arrow, just a simple arrow to shoot. I ended up buying target arrows alright but I had to glue the inserts into the shaft and I also had to buy the tips to screw into the inserts. Actually I was intimidated by the process of going to the a sporting good store because the terms used was so different. The bows, well that was a whole different story. When I started looking a bows all I saw was the price and I quickly changed my mind about buying a bow. Finally, as you already know I made my own and it worked so I start making more and selling them at reasonable prices. 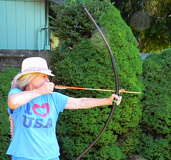 This page is going to provide you with a little information about archery terminology and a few other tips about archery..
First and formost if you have any questions please feel free to ask. I certainly don't know all the answer and I consider myself a novice in the field of archery but I can find the answers. So don't hesitate to give me a call. I hope this information has help just a little. It is really only just the tip of the ice berg when it comes to archery exercises but maybe it will lead you to do more research on the subject. BW Bows and Bob and Mary Wilkerson are committed to providing the best products, the best customer service and best on line experience you can find on the Internet. please keep coming back to find out what we have added. If you take any pictures of you shooting your bow please send them to us to post on this site with your permission. To determine which link you need for your bow just look on the invoice to see if you have a Take Down , Full Length or a Light Bow. After you determine which one you have click on the link for instructions and a few videos.